Discussion in 'Mac mini' started by rrl, Oct 20, 2014. Just a placeholder link, no info there yet. Title used the word "almost". What part didn't you understand? I changed the title after I realized the link was just a placeholder. My fault, not theirs. But is the Ram soldered on the high end core i5/Core i7 as well? And, correct me if I am wrong, but does not this one seem much more "modular"? Meaning easy to tear down to, say, upgrade the SSD without breaking 500 little tiny wires????????? We started with a base model Mac mini with a fresh install of OS X 10.10 Yosemite. The 2014 Mac mini ships with the same build of Yosemite as the general release (14A389). All benchmarks were ran today. Below is the Mid-2011 (Macmini5,1), Late-2012 (Macmini6,1), and the Late-2014 (Macmini7,1). As you can see on the new Mac mini, the single-core performance is greater, multi-core is in between the 5,1 and 6,1 models. Unfortunately I was looking forward to a multi-core boost on the quad core, or at least a price drop for comparable performance and that's not going to happen. I just ordered the base config and a 120 GB SSD. Both should arrive within three days, we'll see how easy / hard it is to change the HDD to an SSD. I'll be watching. Did you get the PCIe SSD or the SATA SSD to install? Anybody know what the security screws are T6 torx / pentelope or something else ? I had some hopes, but the timing combined with Intel Broad-not-so-well delay were not very favorable, so no surprise we got this mini-mess. I would hang on to my hack for another year or two until "SkyLake" version is out. As I noted in one of the other threads... YES. I have access to Apple's service catalog, the exploded view of the system shows logic board part numbers indicating the "high-end" i5 and i7 models with different RAM capacities, indicating that the RAM is part of the logic board assembly. So from the pics this is the bottom base model? Where would/does a pci-e storage stick go? Also it say's it only has one single sata interface and yet can connect two internal storage devices...explain? Look at the photos in the teardown. There is a presumed PCIe connector shown. 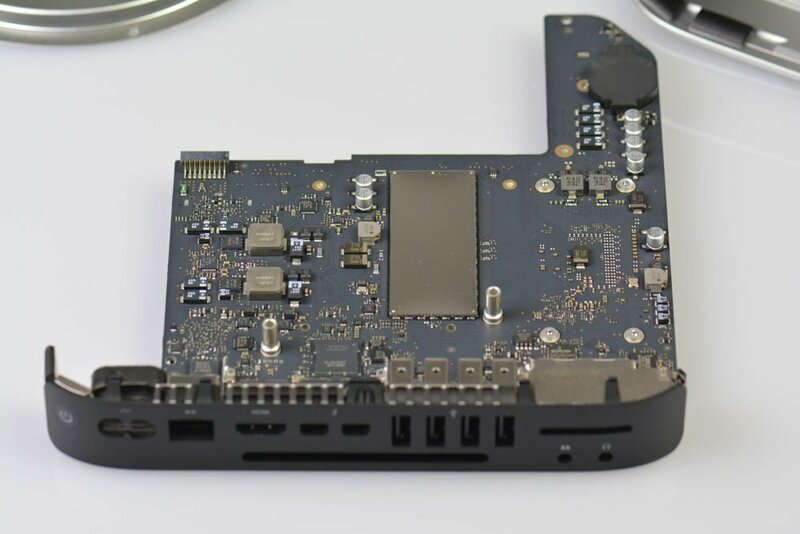 Looks like the saving grace is that you can add an SSD (PCIe blade-style, same as other Macs) down the road, since the socket exists even on the base model. And disassembly looks very easy as long as you don't care about your warranty. Don't even need the special u-shaped tool that previous generations needed. Too bad there aren't any aftermarket SSD's that will work yet, but you could replace the HDD with a 7mm SATAIII unit as long as you get the new T6 security Torx bit. Way cool! This is good news! I hated that U shaped tool situation. Wouldn't this SSD fit??? I think it would! In theory that should work, assuming those are legit (Samsung!) parts from a reputable seller. The cheaper option would be to replace the HDD with a sata3 SSD, though you wouldn't get PCIe speeds. Looks extremely difficult. I'd be too worried that I'd break something. Not worth the risk, imo.